It is easy to be charmed by the eclectic aesthetics of Essaouira, an ancient port city located on the Atlantic coast of Morocco. It has not yet been over run by giant chain hotels and lines of tour buses parked on its shores despite its increasing popularity with tourists. A laid back atmosphere remains in tact. Seagulls shriek on the ramparts of the fortified city near the busy port where beautiful Moroccan blue fishing boats are moored. Nearby an expansive sandy beach is populated by wind, kite and board surfers who benefit from mighty year round winds. This boho chic city has always attracted an artsy crowd, from movie moguls to rock stars. Orson Wells shot scenes for the movie Othello in the 1950s. The alleys and lanes of the medina, or old city, with white washed buildings and blue shutters are an exceptional place to seek out Moroccan treasure. The quality of textiles, carpets, pottery and leather goods is excellent and bargaining is more relaxed than in the souks (markets) of the imperial cities. I wonder how many travelers have returned from Morocco inspired by Moroccan design and successfully incorporated it into their décor. There is someone who knows for sure how to accomplish this-Maryam an American woman and citizen of the world who lives with her family in Marrakesh. If you haven’t been to Morocco you certainly will want to pack your bags and go after reading her beautifully written and illustrated blog My Marrakesh. Thank you so much for your lovely words about me! And your post makes me pine for Essaouira! 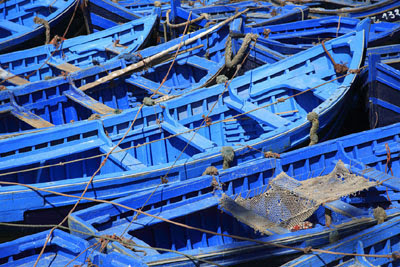 Your blog makes me want to return to Morocco.